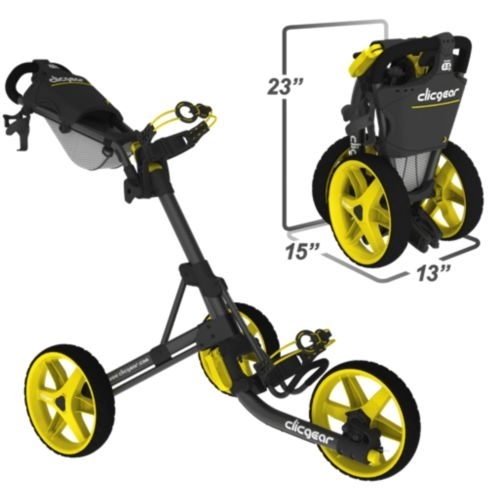 The Clicgear 3.5 is the latest update to our very successful three wheel golf pushcart design. We have added several improvements to the original design to make this the best model ever. These include, increased cargo net storage by 80% for even more room. Added a new Easy-Clip Bag Strap System that makes it easier to adjust and fit your bag on the cart, no matter the size or type of bag. Improved the umbrella storage clip to prevent any lost Umbrella Tubes. The Clicgear 3.5 also has a redesigned the Brake System with a new cable anchor pivot assembly that eliminates cable wear and damage. The brake gear and hammer profiles have also been improved to engage better and reduce stress on the cable. Last but not least we improved the cup holder with the introduction of the Cup Holder Plus which is a more adjustable and lighter cup mount. The 3.5 continues our improvement of the Clicgear cart range. We still stand behind all our carts and accessories and know that they are designed to last and be repairable if needed. No rivets, wires or cheap parts to keep them together. Just properly engineered components and structures. Call us on (06) 364 6468 to get the best NZ price on the Clicgear 3.5 trundler. Read more about our range of trundlers and carts.